(Variant) An expression that is evaluated in the current scope and that specifies the name or key to look up. (Variant) An expression that is evaluated for each row in a dataset and that specifies the name or key to match on. 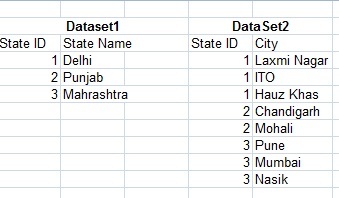 A constant that specifies the name of a dataset in the report. We have two dataset dataset1 and dataset2. 1. If multiple matches are found, the value from the first matching row will be returned. 2. We cannot use any aggregate functions in the result_expression. In the Lookup () we have seen It is used to fetch the first matching value from the other DataSet. Now, if we want all the matching values from the other DataSet. There is another function LookupSet. The LookupSet function compares a value in the current scope to a value in a destination dataset and returns a list of values from the destination dataset based on matches found. source_expression – The field which will act as the key/lookup value for the destination. This will be evaluated in the current scope – generally the DataSet with which the Tablix is bound. destination_expression – The field in which the source expression will be looked in. This field will belong to the dataset provided in the same function as the last parameter. result_expression – The field we want to retrieve from the destination DataSet for the matching source_expression & destination_expression for each row. Dataset – The Dataset in which we want to look the values into. Returns – A VariantArray, or Nothing if there is no match. 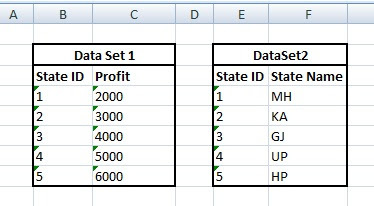 1. if multiple matches are found, all the values from the matching rows will be returned. The MultiLookup function compares a list of values in the current scope to the values in the destination dataset and returns a list of values from the destination dataset based on matches found. MultiLookup is equivalent to calling the Lookup function for a set of key values and is used when there is a 1:1 relationship. source_expression – The field which will act as the key/lookup value for the destination. This will be evaluated in the current scope – generally the DataSet with which the Tablix is bound. The only difference from the previous lookup functions is that, here this is a VariantArray. Note, If multiple matches are found, the value from the first matching row will be returned for all the values in the source expression. And we cannot use any aggregate functions in the result_expression. Split() – To convert the comma separated City value into a value array. Multilookup() – To find the Name of City value for the matching City_ID. Join() – Prepare the comma separated string for the names returned by the Multilookup() as array. These beautiful features bring a lot of satisfaction to report writer and developers to marge values from two datasets. These functions are is playing a very handy role to combine data from two datasets in a single data region which was not possible in earlier versions of Reporting Services.